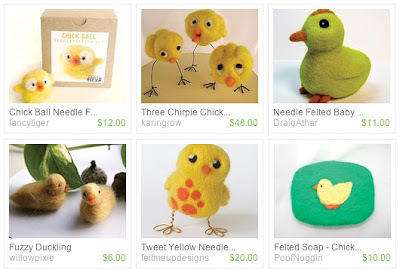 The Funky Felter: It's Fuzzy Chickadee Friday! To put a smile on your tired TGIF face! It's Fuzzy Chickadee Friday! To put a smile on your tired TGIF face! A little while ago, I declared it Bunny Friday. Today, I'm declaring it Fuzzy Chickadee Friday in honor of some cutie pie felted chicks that I've found on Etsy. They make me think of sugary soft candy peeps! These felted wool creations will hopefully bring a smile to your tired face after a long work week. Also, I just feel the need to share something so darn cute with my readers every once in a while. There's never too much cute to go around! thanks so much for including my tweet with all these wonderful chickadees!!! You've made my friday... much love.